Drive in pallet racking is ideal for bulk storage of similar items or refrigerated/ freezer storage. In this system, goods are stored several pallets deep on guide rails within the structure and fork lift trucks drive in to the racking to retrieve them. Normally pallets are accessed from one side only, which makes this system ideal for building against a wall, although drive-through versions are also available for access from two sides for improved stock rotation. The nature of drive in pallet racking systems is such that goods are accessed on a “last in, first out” basis, so this is not a solution where stock rotation is important (in such cases, narrow aisle racking may be more appropriate). It is, however, ideal for bulk or long term storage, when space is at a premium or for goods delivered and dispatched in large batches. 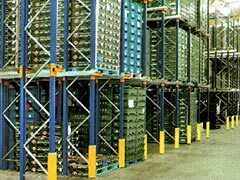 Since pallets are stored several rows deep rather than in a conventional manner with aisles between each row, much more of the available floor space is used for storage than is the case with standard racking. Depending on the particular configuration, up to 75% more pallets can be stored in the same space when using drive in pallet racking than when using standard racking. This makes it ideal for freezer storage, for example, where the cold storage space is expensive, or for bulk storage of non-perishable items. This economical use of space is further enhanced by the fact that no special handling equipment is required – Greenoaks’ drive in pallet racking systems are fully compatible with standard fork lift trucks. Contact us now and find the right Drive In Pallet Racking solution for you! With fork lift trucks frequently driving in and out of it, this type of pallet racking system is subject to a higher degree of wear and tear than standard systems. With its durable steel components and sturdy bolting and bracing construction, however, Greenoak’s Premierack can easily withstand the rigours of daily use. Drive In Pallet Racking Solutions. Call us on 0161 775 7178 or contact us below! If you think a drive in pallet racking solution might solve you space problems, call us today on 0161 775 7178 or fill out the form below.